I’m pretty excited to be sharing one of my favorite autumn treats. This is a go-to each year, and honestly, I have fiends who beg me to come make them! 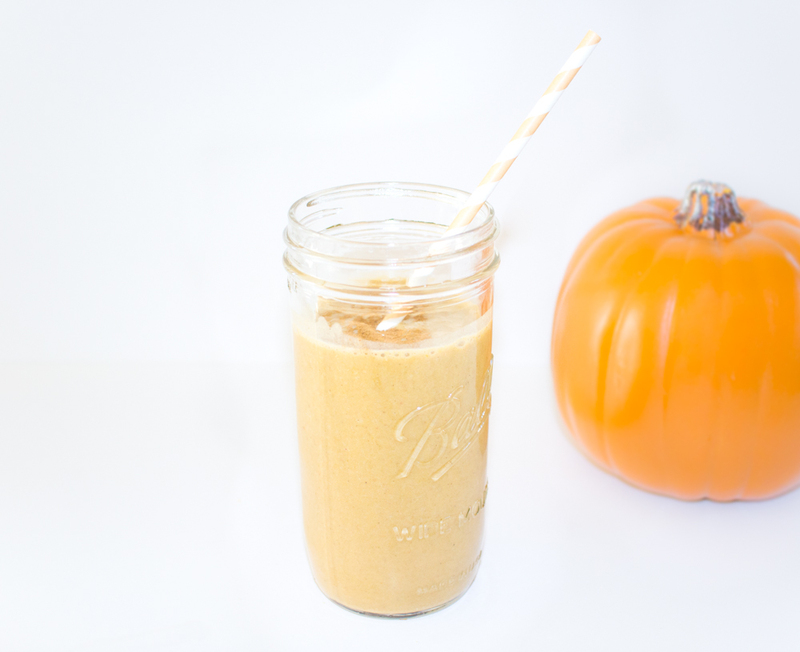 It’s a pumpkin pie smoothie! The recipe is foolproof, and bound to captivate you by the flavors of fall. As you know I am a pretty busy lady – I spend many mornings on the go with G, so my breakfasts are usually in a cup. This smoothie is basically a little taste of heaven! Keep reading to see the recipe! This is a pretty simple shake with little to no prep. I keep frozen bananas and almond milk ice cubes on hand at all times because I am such a smoothie drinker! 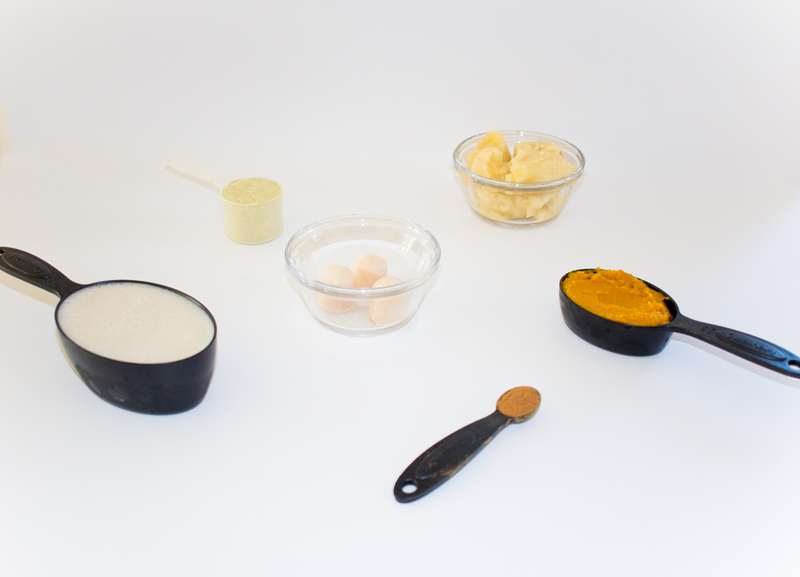 To begin, simply gather your ingredients. Pour each of them into a high-speed blender, and blend until smooth! Top with extra cinnamon or nutmeg, and enjoy a little taste of Fall! Side note: I cannot tell you how much fun I’ve been having sharing my food journey with you all via Snapchat and Instagram stories. It’s been a blast answering questions and sharing great recipes with everyone, so thank you for being so eager to know about it all – I love sharing! Please let me know on here, snap, or insta if you end up trying out this drink! It’s one of my favorites right now. If you enjoyed this recipe, please consider pinning either of the images below so other’s can find this article and try the recipe too! Yum! I'm going to try this. Seeing pumkin purée at the store now. I always have frozen bananas on hand but not ice cubes. I need to order another ice cube tray! I cannot wait to try this out !!!! Yum! Thanks for sharing. This sounds amazing! I'm not even Vegan and I want to try it! I've never tried making a pumpkin smoothie but this looks soooo yummy! Thanks for sharing! Definitely going to make this this week!!! I drink smoothies on the regular, can't wait to give this a try! YAY for pumpkin season! This looks delish! Thanks for sharing this recipe! 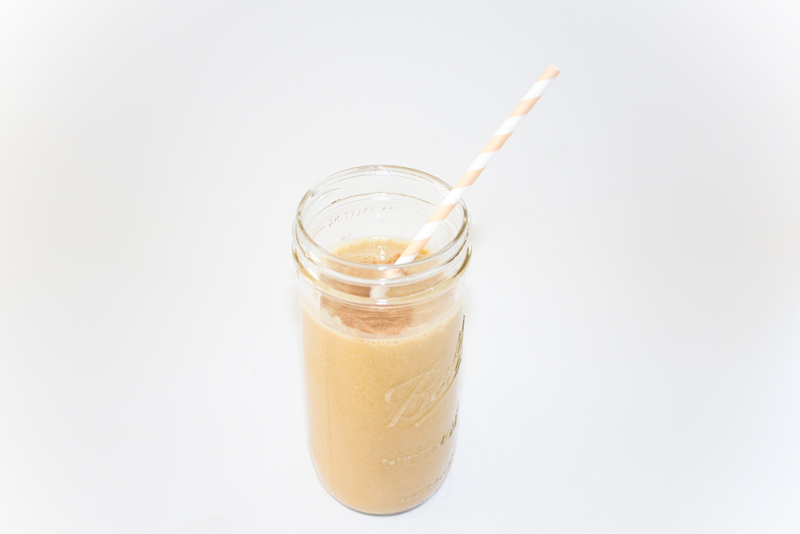 A vegan protein smoothie is a wonderful way to start the day. Of course, I'm loving everything pumpkin! It's that season and I'm so happy! After finishing whole 30 recently, I decided I want to eat clean now! This smoothie sounds DELICIOUS!! Pinning now! I love that its finally pumpkin time! This recipe sounds yummy! I have honestly been wanting to try this!! I'm going to check it out now!! That looks so delicious! Need to try !!! I'm not a huge pumpkin flavor fan but this sounds yummy! I love pumpkin and this look great! I've never really used protein powder, but if I'm going to try it, I'll definitely try the pumpkin! I probably shouldn't have read this post at 12:15 am on a Friday night! LOL this looks so yummy! Ummm, this looks incredibly delicious!! I'm tempted to go out and get the stuff now to make it, haha!! This looks SO delicious! I have a protein smoothie every morning, and I'm definitely going to need to incorporate some fall flavored ones like this! I've never tried anything with protein but have been dying to! This sounds so healthy and so yummy! Will have to give this a try!